Noakes watched as aides whisked away the President’s glass of cola each time a stranger entered, in case it might be mistaken for whiskey. Such meticulous image control raises the stakes when painting the great, the good or the merely famous. 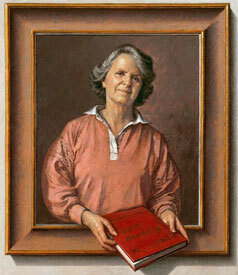 Subjects cede to the painter that ‘window into the soul’ that makes a great portrait. 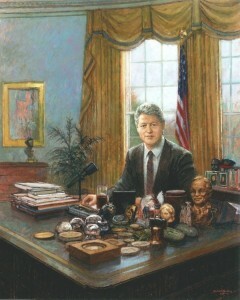 So when President Clinton said, “You know, I’m very pissed off”, luckily for Michael Noakes, the object of the president’s ire was an incompetent aide, rather than the man painting him. Although the most well-known are usually those who are painted most often, they remain fascinated by the process. Noakes notes that his subjects have become much more circumspect over the years. “If you’re very famous it must be a terrible inhibition, because you are afraid of being reported to the Daily Mail. That has changed over my lifetime”. “I was thrown in the deep end in 1972,” Noakes recalls, “when I had to paint seven members of the Royal Family, the Lord Mayor and his wife in separate sittings in various locations” for a painting that hangs in the Guildhall today. “It was an extremely complicated picture to do.” Noakes had persuaded the Private Secretary to ask the Queen to let him measure her so as to get the proportions and perspective right in this composite portrait. To Noakes’ dismay he found the Secretary had forgotten to ask the Queen leaving it up to him to do so during their first sitting. The Queen acquiesced but so shredded were Noakes’ nerves that he very nearly blotted her blue silk dress with his black felt-tip marker. In another sitting with the Queen he recalls growing increasingly irritated at the stream of interruptions of various foot servants. At yet another knock on the door Noakes had had quite enough and forgetting that it was not his Palace, it was he who cried out “What do you want?” only for The Prince of Wales to poke his head through the door and cautiously ask if he might speak to the Queen. Noakes notes that as an artist he was probably granted more leniency in such moments than most others would have been. In 1999 Noakes sketched the Queen regularly to illustrate The Daily Life of the Queen, An Artist’s Diary, written by his late wife, Vivien Noakes. Always polite and measured when speaking of those whom he depicts, Noakes is nevertheless emphatic in his praise for the Monarch. “She can give advice which can often be ignored but that restraining potential is fascinating, in that it can impose checks and balances as far as the elected politician is concerned”. Noakes’ work doesn’t always just hang on the wall, the Royal Mint having made a £5 coin of his design marking the Prince of Wales’ 50th birthday. He is also particularly proud of the double-sided record sleeve he did for a Frank Sinatra record that achieved platinum status. Making him the only portrait painter to have been awarded a platinum disk for work on a record-sleeve. 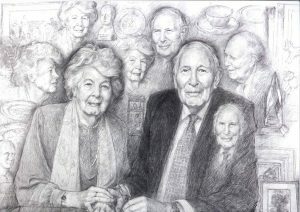 More recently he has completed a large drawing of Sir Roger and Lady Bannister, marking 60 years since Sir Roger famously became the first man to run a sub-four-minute mile. 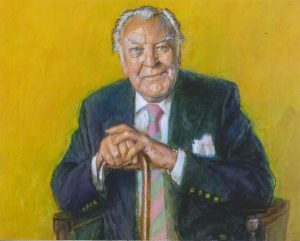 He is currently working on at least four other portraits including Sir Donald Sinden and the wives of a knight and baronet; and will soon start a posthumous portrait of his old friend, the actor Frank Thornton. Not a man to discuss the technical aspects of getting the paint onto the canvas, Noakes nevertheless enjoys deploying a bravura-like command of his craft. A trompe l’oeil volume of Edward Lear’s nonsense verse, held in the hands of his late wife, projects from her portrait as a reference to her expertise as Lear’s biographer. Noakes speaks of her with evident affection, recalling her gifts as an inventive cook, incredible hostess, and generous spirit. PreviousPrevious post:Dr. Leonard McCombNextNext post:Winner!